After upgrading most of my modules dont have titles anymore. Furthermore they dont have any text when I "configure" a module. top right of screen, click 'clear cache'. I'm having also troubles on one upgraded shop. 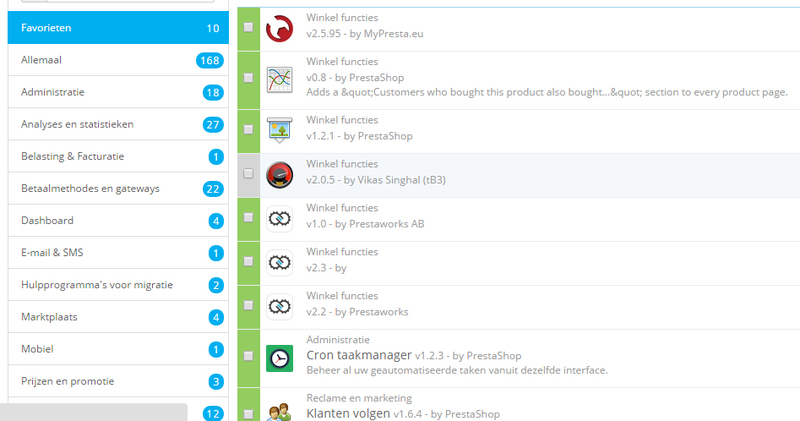 Have 3 default/test shops installed in different languages: Englisch, German and Portuguese. English and German Shop had no problems on upgrade. The Portuguese one has several problems on back-office: cannot use search bar on modules = is dead. AL SHOPS HAVE NO EXTRAS INSTALLED, THEY ARE DEFAULT. Cannot open any tab on products = dead. On product description (tynymce disappeared). Cannot use rollback = is dead. List of changed files does not load. Shop was upgraded with SUCCESSFULLY quit. Verified all CHMOD. Are the same as on the other two shops upgraded successfully. Cleared all cache options (smarty, browser) and tried several browsers. As I'm having also problems with caching and JS for PS 1.6.0.9, I disabled xcache and now running better with opcodecache. BUT also this does not resolve the problems of the Portuguese upgraded shop. Seems that on this shop, or is a problem of the language package on upgrade the 1-click, the upgrade failled. Added also problem on bugtracker. i thought that it's a case of some non default addon, but as we see - it's not. in this case it's necessary to inspect several things. please check permissions, cache/xml folder (typically best at 755) and the *.xml files (typically best at 644). Gonna replace all files now with the 1.6.11 package files. See what that does. You people got some more suggestions? Love the help! Thank you so much. hmm... investigated it a little more and I noticed something. how do those same modules look when you click 'all' modules? It is a matter of the category the module belongs to, not a matter of which category is displayed. I have less lines and some variables are not the same. Weird. Same problem with classes/Translate.php a bit different. Someone have a fixed Translate.php file? I copied the translate.php file that I found on GitHub here https://github.com/PrestaShop/PrestaShop/blob/1.6/classes/Translate.php and fixed all problems!! I don't want to do that. If files are different (mine and the fixed), it's too dangerous, even if it works.